If you are looking for a basic overview of binary options, and how to get started with this type of trading, BinaryShift.com offers a free ebook as a guide for beginners. While there are some issues with the ebook, overall it is a solid and informative resource for the beginning binary investor. Shifting to Success offers you a look at the basics of binary options trading. You can receive a basic overview of how binary options trading works, as well as insights into some of the most basic of strategies. However, it’s important to note that this guide doesn’t offer very many details about how to go about making trades, nor is there a large glossary of terms that you might need to know. Also, while you can learn a few good points about choosing a broker, there aren’t any red flags to watch out for. There is a link to Binary Shift’s list of brokers, and reviews. One of the things I like about this guide is how straightforward it is about the basics. While the information is largely general in nature, it is still applicable and usable, and does a good job of setting forth the basics for the beginner. The guide even describes a few simple strategies that can be used to help the beginner get started. There are also some useful tips about trading options related to assets you know, and getting to understand how to read charts before starting. They point a reader to one vital “rule of thumb” set forth in the guide: Never risk more than 10% of your balance at once – and don’t risk money you cannot afford to lose. In a general way, Shifting to Success is quite useful. There are some issues with grammar and flow, and the examples used in the book (EUR/USD above 1.40, Dow just over 10,000) date it to a couple years ago, but most of the information is fairly timeless. A couple little tweaks to the examples could help the guide seem a little more up-to-date. The information in the guide is not particularly original; most of it can be found with a general online search. However, the fact that the information is gathered in one, easy-to-read place is a plus. I would like to see a more extensive glossary of terms, but that information can be found in various places around the Internet, so it is not too big a loss. For the beginner, Shifting to Success can be a solid resource. Most of the information is evergreen, and it can give you a good idea of where to start, and what you need to do to beginning building success as a binary options trader. More advanced traders, looking for more complex opportunities and strategies, should look elsewhere. 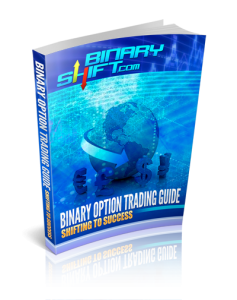 Binary Options Trading Guide: Shifting to Success is available for a free download from BinaryShift.com when you subscribe to the website’s newsletter.